Want some bT2 SWAG? Check out our giveaway!! All you have to do is follow this giveaway post from our Beverly Taylor Design facebook page! Just click here and look for the “giveaway” post! Share it on your facebook and ask all of your friends to do the same!!!! Cross your fingers and hope to be our lucky liker! Don’t Forget bT2’s Kick-Off Contest and Have a Great Weekend!!!! Entries are coming in for our design contests. Today we received our first video entry. SO exciting!Look back at our August 1st post if you haven’t heard about bT2 Internet Interiors design giveaway!!!! Entries are coming in for our design contests. Today we received our first video entry. 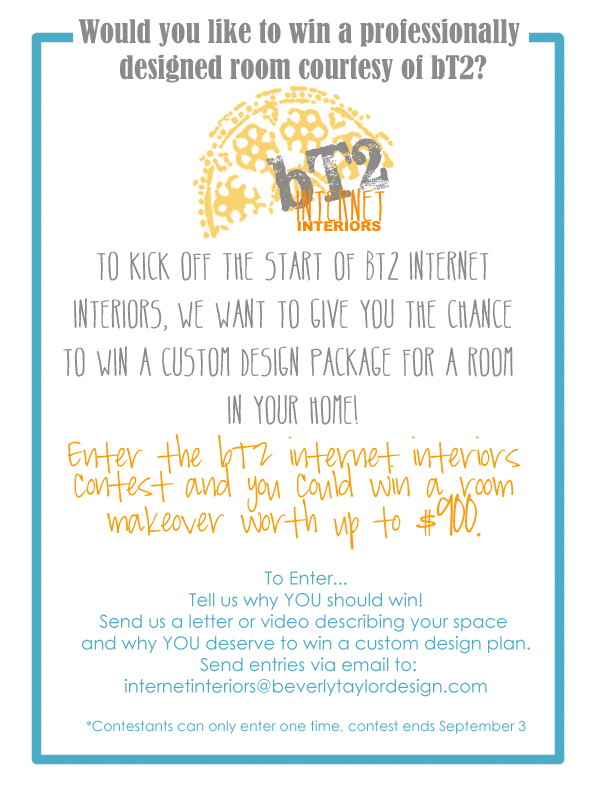 bT2 Internet Interiors design giveaway!!!! Win a FREE custom design plan for your room! bT2 Internet Interiors is a service aimed towards the do-it-yourselfers that need to be steered in the right direction. We’re like the training wheels you had on your first bike! You tell us what you want, what you love, what inspires you, and we will put together a custom design plan that allows you the flexibility of doing it on your own time frame and budget. You measure your space, send us pictures, tell us your budget, send us your inspiration, and we will custom-design the perfect master plan for your project. Oh wait, but it does! To kick off the start of our wonderful new service, enter in to the bT2 Internet Interiors contest for your chance to win a FREE custom design plan for your space. Send us an email, video, or letter and tell us why YOU deserve to win. OK Everyone, as promised yesterday, here are the details for our bT2 Internet Interiors Contest!